“Three years after the Civil War ended, on May 5, 1868, the head of an organization of Union veterans — the Grand Army of the Republic (GAR) — established Decoration Day as a time for the nation to decorate the graves of the war dead with flowers. Maj. Gen. John A. Logan declared that Decoration Day should be observed on May 30. It is believed that date was chosen because flowers would be in bloom all over the country. 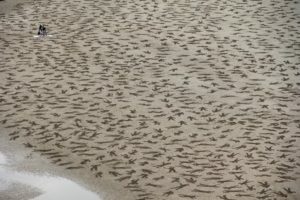 On June 6, 1944, in Operation Overlord, the Allies (USA, UK, Canada, Australia, Free France, New Zealand, Belgium, Greece, Poland, Denmark, Czechoslovakia, Netherlands, Norway) made a major push into northern continental Europe through the beaches of Normandy in France. Over 10,000 men died, but the objective was achieved and Germany surrendered 11 months later. 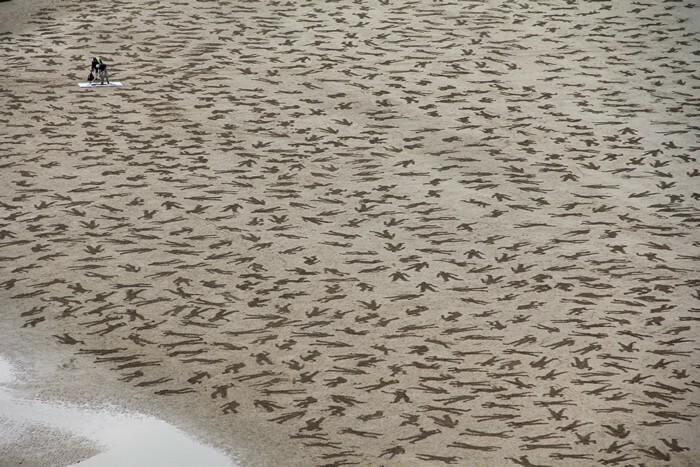 In September 2013, two artists etched over 9,000 silhouettes into the sand of those beaches to commemorate the soldiers and civilians who died on that day. I grew up in Rutland, Vermont. Rutland is divided in Rutland City and Rutland Town. I grew up in Rutland Town. Current population: City 16,495 as of 2010. Town: 4,038 as of 2000 (statistics from Wikipedia). Rutland City would have lost 55% of its population. Rutland Town would have been eradicated twice over. And that was just one day. One battle. One war. It is the ultimate sacrifice by some for the greater good of the many.